Every time when Muslims face such trials, people start to think over the reasons of what happened, and also they look for ways how to counter such repressions and minimalize harms from it. Such shocks naturally raise sensitivity of detained Muslims, their relatives and friends. This is natural but it can lead to a situation when people may forget about true criterion to evaluate this repressions and people may appeal to emotions. So it is very important in such situations to remind regularly to yourself and other Muslims the true valuation of what is happening to avoid despair, faintheartedness and weakness. As for true valuation, it is contained in reminding of Allah, and His teachings that are located in Holy Quran since Allah says in Surah “Raa’d”: الَّذِينَ آمَنُواْ وَتَطْمَئِنُّ قُلُوبُهُم بِذِكْرِ اللّهِ أَلاَ بِذِكْرِ اللّهِ تَطْمَئِنُّ الْقُلُوبُ “Those who believe (in the Oneness of Allah – Islamic Monotheism), and whose hearts find rest in the remembrance of Allah, Verily, in the remembrance of Allah do hearts find rest.” (13:28). Dear brothers and sisters, let us appeal to some ayahs of Holy Quran that explain to us the essence of such events and stands that are adopted by Muslims and their enemies among Kuffar. The permanent nature of struggle between Iman and Kufr is mentioned in the following ayah: وَلَوْلاَ دَفْعُ اللّهِ النَّاسَ بَعْضَهُمْ بِبَعْضٍ لَّفَسَدَتِ الأَرْضُ وَلَـكِنَّ اللّهَ ذُو فَضْلٍ عَلَى الْعَالَمِينَ “And if Allah did not check one set of people by means of another, the earth would indeed be full of mischief. But Allah is full of Bounty to the ‘Alamin (mankind, jinns and all that exists).” (2:251). And says in other ayah: يُرِيدُونَ أَن يُطْفِؤُواْ نُورَ اللّهِ بِأَفْوَاهِهِمْ وَيَأْبَى اللّهُ إِلاَّ أَن يُتِمَّ نُورَهُ وَلَوْ كَرِهَ الْكَافِرُونَ “They (the disbelievers, the Jews and the Christians) want to extinguish Allah’s Light (with which Muhammad has been sent – Islamic Monotheism) with their mouths, but Allah will not allow except that His Light should be perfected even though the Kafirun (disbelievers) hate (it).” (9:32). The Muslims stand against treats from the Kuffar when they follow the Truth is mentioned in the following ayah: الَّذِينَ قَالَ لَهُمُ النَّاسُ إِنَّ النَّاسَ قَدْ جَمَعُواْ لَكُمْ فَاخْشَوْهُمْ فَزَادَهُمْ إِيمَاناً وَقَالُواْ حَسْبُنَا اللّهُ وَنِعْمَ الْوَكِيلُ “Those (i.e. believers) unto whom the people (hypocrites) said, “Verily, the people (pagans) have gathered against you (a great army), therefore, fear them.” But it (only) increased them in Faith, and they said: “Allah (Alone) is Sufficient for us, and He is the Best Disposer of affairs (for us)”.” (3:173). This is the stand of Muslims and their merits that are mentioned by Allah in Quran. 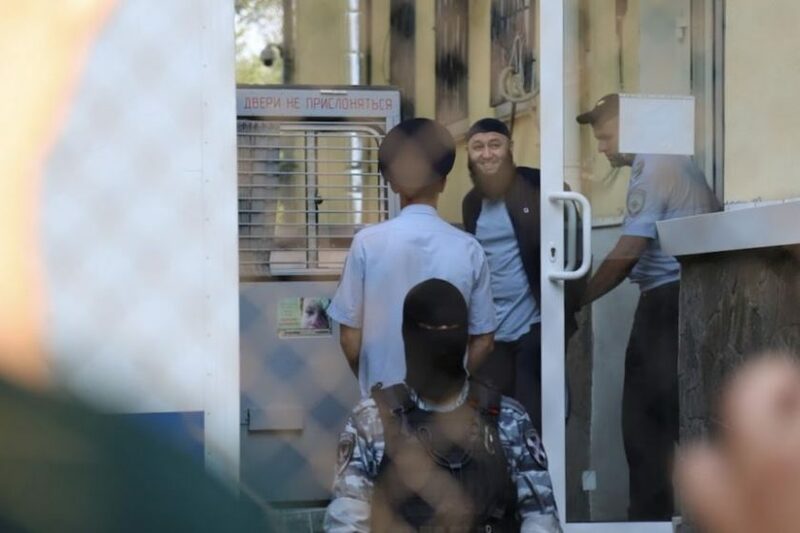 When we look at the stand of Crimean Muslims, Crimean Tatars that face these repressions of theRussian authorities, we see how hundreds and even thousands people openly supported the arrested brothers and their families. As for concealed and nonpublic support, it is much more. This support is not seen on TV screens and Media since it is hidden, but Muslims know about it and Kuffar do not know and think that they forced all people to be afraid. As for tyrants and their henchman, Allah (swt) says about them in Surah Baqarah: وَلاَ يَزَالُونَ يُقَاتِلُونَكُمْ حَتَّىَ يَرُدُّوكُمْ عَن دِينِكُمْ إِنِ اسْتَطَاعُواْ “And they will never cease fighting you until they turn you back from your religion (Islamic Monotheism) if they can.” (2:217). It is also worse to mention that criminals with shoulder strap and judge’s gown among the so called law enforcement institutions and judges; undoubtedly, they will be caught by illness, poverty and failure in this life after Allah will respond on doua’s of people who were oppressed by them, and that they will be punished in the Judgment Day. In this regard, we should also mention about pusillanimous Muslim traitors among leaders of pro-Russian organisations and Muslim spiritual administrations, who justify the Russian authorities crimes against Crimean Muslims. Their main argument is «we warned about prohibition of such activities according to Russian law». These people are paralyzed by fear in such manner that they do not judge Muslims according to Quran and Sunnah, while these Muslims carried the Islamic Dawah, cared about Muslim families, refused to cooperate with the Russian special agencies and shed light on the Russian repressions in Media. Russian constitution and its penal code are considered as Shariah by these traitors. They should know that their faintheartedness and fear from repressive Russian machine will not be a justification for them in the Judgment Day as Allah says in Surah An-Nisa: إِنَّ الَّذِينَ تَوَفَّاهُمُ الْمَلآئِكَةُ ظَالِمِي أَنْفُسِهِمْ قَالُواْ فِيمَ كُنتُمْ قَالُواْ كُنَّا مُسْتَضْعَفِينَ فِي الأَرْضِ قَالْوَاْ أَلَمْ تَكُنْ أَرْضُ اللّهِ وَاسِعَةً فَتُهَاجِرُواْ فِيهَا فَأُوْلَـئِكَ مَأْوَاهُمْ جَهَنَّمُ وَسَاءتْ مَصِيرًا “Verily! As for those whom the angels take (in death) while they are wronging themselves (as they stayed among the disbelievers even though emigration was obligatory for them), they (angels) say (to them): “In what (condition) were you?” They reply: “We were weak and oppressed on earth.” They (angels) say: “Was not the earth of Allah spacious enough for you to emigrate therein?” Such men will find their abode in Hell – What an evil destination!” (4:97). These are the positions and stands of confronting sides in this struggle; we should remind ourselves about them and remind about them to other Muslims in order to overcome this trial. Allah (swt) says in Surah Az-Zariyat: وَذَكِّرْ فَإِنَّ الذِّكْرَى تَنفَعُ الْمُؤْمِنِينَ “And remind (by preaching the Qur’an, O Muhammad) for verily, the reminding profits the believers.” (51:55).